What is ultra-feminine, timeless and more than deserving of a spot in your regular wardrobe rotation? Accordion pleats! Although at first glance these sharp, small pleats may not seem like anything special, trust me when I say that they’re the next big thing! Whether you prefer skirts or dresses (or both! ), accordion pleats will instantly become a statement piece that you’ll want to wear again and again. Dress it up with a blouse or pair it with a lightweight t-shirt; either way, you’re bound to look glamorous. If you’re still on the line with accordion pleats, here’s some inspiration that I think will change your mind! 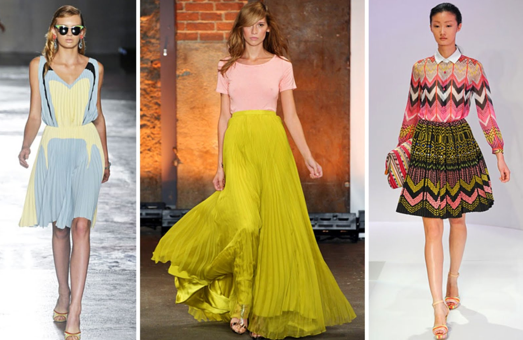 From Prada and Christian Siriano to Carven, accordion pleats made a major showing in spring 2012 runway shows. 1. How many dresses do you see with accordion pleats nowadays? Leave the low necklines and super short hemlines behind this season. Not only are accordion pleats the ultimate accoutrement, but they’re also extremely classy. Take one look at the pastel floral frock by Prada above, and tell me you’re not in love...sigh. 2. Flowy, effortless and relaxed, this chartreuse maxi skirt by Siriano is absolutely stunning. See how incredible it looks when paired with an everyday tee? 3. 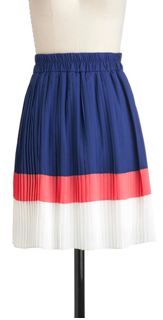 Saving my favorite for last, feast your eyes on this printed accordion pleat skirt by Carven. While you may be hesitant to don both pleats and zany prints at the same time, the end result is so worth it! It’s unanimous, accordion pleats are a major “DO” and will be sticking around! From left to right: Blair Eadie (Atlantic-Pacific), Annabelle Fleur (Viva Luxury), Emily Schuman (Cupcakes and Cashmere) and Juley (Swank Heights). Oh, the things that we learn from fashion bloggers. When it comes to hit or miss fashion trends, go directly to the tastemakers themselves. Once every other blogger is sporting a certain trend, you know that it’s either up-and-coming or about to hit mainstream. 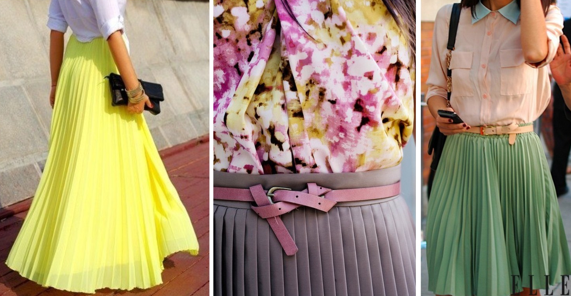 Based on the gorgeous pleated maxi skirts and dress above, it’s safe to say that everyone is on the pleats bandwagon! 1. Bee (Blair Eadie) does no wrong! Mixing a vibrant purple pleat maxi with a yellow-green top and leather jacket, this look is fierce! 2. Go monochromatic like Annabelle, and wear variations of one color. Accessorize with a sequined clutch and a statement necklace for an easy-to-style ensemble! 3. I never thought I’d say this, but I’m yearning for a highlighter yellow skirt! Emily pulls off this blinding hue so flawlessly that I’m speechless. 4. Based on Juley’s red, white and blue accordion pleat dress, I’d say that the Fourth of July came early this year. For this look, no commentary needed, it’s that fab! In the details, just look at the endless possibilities when it comes to styling your accordion pleat skirts. More pleats! If you’re going to invest in one pleated item this season, make it a skirt. From skirts that fall slightly above your knees to full-on maxis, there’s a fit for everyone. Add some character to your accordion pleats by knotting a belt or tucking in a sheer collared blouse. If you’re feeling minimalist, opt for an outfit entirely in pastel hues. Or maybe you want something more eye-catching…hello mellow-yellow maxi! With this extremely affordable skirt from Forever 21, you can rock not one, not two, but three major trends at once: accordion pleats, the high-low skirt and coral (the ultimate summertime hue!). At only $25, this skirt is just asking to be tried on! 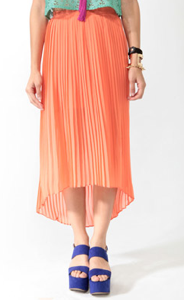 On a hot, summery day, a lightweight, airy pleat skirt is just what you need to keep you cool. Dress it up for work or wear it on the boardwalk, and one thing’s for sure, you’ll definitely be noticed! Tuck in a sleeveless blouse or simple tee and strappy sandals to complete this chic color-block look. 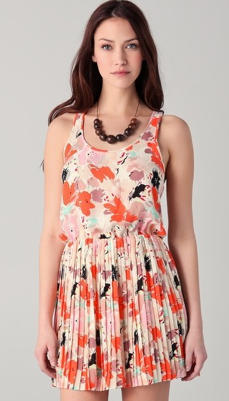 Start your summer off right with a playful floral frock that just so happens to be pleated. Thanks to its punch color palette, you won’t have any trouble finding bangles and chunky necklaces to accessorize with it. Throw on your favorite flip-flops and shades, and you’re more than ready for some prime time in the sun! This racer back dress is pricey, but definitely worth splurging on. When in doubt, say yes to pleats! What do you think of accordion pleats – and more importantly – will you be sporting them this summer? Leave us a comment below. Agreed! And I knew there was a name for this type of pleating! I have a vintage maxi nightgown sporting these pleats from its empire waist to the floor (https://www.etsy.com/listing/107278520/70s-accordion-pleated-maxi-nightgown-sm ), and I googled the name of the pleats and found your site... glad I did!